Altreonic has the pleasure to announce the new v.2.0 release of its GoedelWorks portal. It inherits from v.1.0. the "systems grammar" that with 16 core concepts allows to define any systems engineering project. It keeps the view that a system is the end-result of a development project whereby a chosen process (often domain and organisation specific) is followed. ANTI-FRAGILE workshop and FISITA papers. Workshop. Jobs. Altreonic has now developed a first port of its OpenComRTOS Designer™ to the ARC family of processor cores of Synopsis, extending further the range of supported processors. This work was done in the context of the Artemis CRAFTERS project that focuses on the design and programming challenge of developing applications with many- and multicore architectures. This is the third publication in the Gödel Series. The publication was written as an application note and shows how OpenComRTOS Designer can be used as a simulation as well as a development environment while keeping the source code. This is achieved by way of the transparent programming model that allows considering a network of processors as a virtual single processor one. The application note applies it to the development of a skid steering controller. 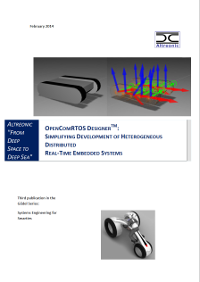 The application note demonstrates how Altreonic's OpenComRTOS Designer allows for embedded software developers of heterogeneous distributed systems to cross develop and simulate their application on a PC environment and seamlessly transfer their code to the target hardware. To this end a Microsemi Evaluation Kit is utilised as the target hardware for a hub motor skid steering based speed controller of an Electric Personal Mobility Device. Visit and meet us at this biennial show, the only event in South Africa that is dedicated to the electronics production, components, systems and applications sector. Booth 4/51. Attend our presentation "Systems Engineering for the masses with GoedelWorks and OpenComRTOS"
ANTIFRAGILE 2014, 2-5 June 2014. Paper available. We need an ARRL-6 and an ARRL-7 level. ARRL-7 is the actual antifragile level. ARRL-6 is halfway (monitoring and preventive maintenance with immediate repair). For ARRL-7, we need to consider the environment with its processes and stakeholders as well as a supervising independent regulating authority as part of the system. Some might call this a "system of systems". Antifragile systems actually exist. Examples are the aviation industry, telecommunication networks, and other. Most of them have a societal importance. We can consider adaptive biological systems as ARRL-8 systems. It was nice to see that the ARRL criterion scales so easily and is in line with what actually exists in the real world. We are currently in the process of investigating what this means for mobility and transport. This system is currently more or less at ARRL-3. Bringing it to ARRL-7 will require a serious effort and paradigm shift, but this could well be the only way to keep it sustainable. Links to the workshop here. ANTIFRAGILE 2014, 2-5 June 2014. Call for papers and participation. Call for papers and participation. Deadline extended till 21st February 2014. This is the first International Workshop on the new topic of Antifragile systems. Keynote speaker: Dr. Kennie H. Jones from NASA kindly agreed to give a keynote speech at ANTIFRAGILE 2014. He will discuss, among other issues, the role that antifragile engineering is playing within NASA and how this research direction may provide an answer to the design challenges of large and complex resilient and antifragile systems. The ERTS2 Congress is a unique European cross sector event on Embedded Software and Systems, a platform for top-level scientific with representatives from universities, research centers and industries. The previous editions gathered more than 100 talks, 500 participants and 60 exhibitors and is located in the heart of a region where Airbus is a leading player in developing safe air transport systems. Altreonic will demonstrate the latest version of GoedelWorks and OpenComRTOS Designer.